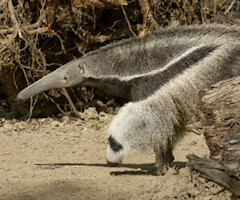 A new, multi-species exhibit, showcasing Anteaters, Guanacos and Rheas. This exhibit celebrates and preserves one of the most highly endangered habitats in the world, the Pampas Grasslands of South America. Visitors are immersed into the environment and surrounded by native plants, grasses and water. With visitor walkways and viewing areas that blur the lines between visitors and exhibit space, the guest feels as though they are part of the space, rather than on the outside looking in. Visitors fully experience the "pampas" through education nodes, interpretive graphics and interactive elements (physical and tactile). The Zoofari Express has been prowling through Zoo grounds since the spring of 1999. While the train is in excellent condition after its 43-year run at Santa's Village (in Skyforest, CA), it now benefits from a more environmentally-friendly electric locomotive. 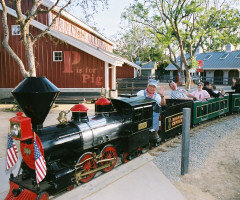 The train travels throughout the Crean Family Farm and up into the northern part of the Zoo for a 6 ½ minute ride, pulling six cars: a tender, four passenger cars and a caboose. 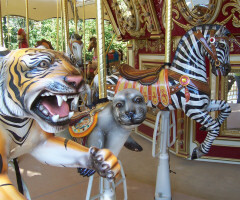 On the Conservation Carrousel, children learn about the value of environmental conservation through the preservation of endangered animals, while having fun on a classic carrousel. Each rider receives an educational collector's card describing an animal and why it is endangered. The carrousel brings much enjoyment to the children of Southern California and guests are delighted to ride any of the carrousel's 33 animal line-up including the Giraffe, Giant Panda, African Elephant, Cheetah, Hummingbird, Lowland Gorilla, Eagle, Jaguar, Zebra, Bengal Tiger, Sea Otter, Panther, Seal, Sea Dragon and a custom-made Anteater. The carrousel also features a wheelchair accessible Swan Chariot. The 64-foot Wheel soars at the entrance to the Crean Family Farm, placing a signature stamp onto this family favorite area. 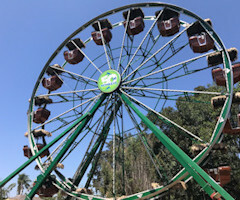 Uniquely designed to spotlight the Santa Ana Zoo's Fifty Monkey heritage, each fully-contained gondola features a unique endangered monkey, furthering the Zoo's dedication to the education of environmental conservation through the preservation of endangered species. Educational graphics telling the story of Joseph Prentice and the Zoo's requirement to house fifty monkeys at all times in order to maintain the land are found along the loading queue-line walkway. At the Crean Family Farm, you can peek into the barn doors and experience a farmyard adventure. Learn about life on an Orange County farm while you feed goats and sheep and milk a replica cow. Learn what it's like to care for farm animals, and learn about the roles rare breeds of animals play on a farm. After you check out the barnyard, you can you can see more the Zoo from a train ride on the Zoofari Express. Then, be sure to take a spin on the Endangered Species Carrousel. For adventure and fun, the Crean Family Farm has plenty of room to learn and play! Note: Feeding and milking activities not available all days. Please call to check if these activities will be available on the day of your visit. provided courtesy of Eric Anderson, O'Leary & Partners. On August 1, 1996, the Colors of the Amazon walk-through aviary opened its double-doors and has been a favorite attraction at the Zoo ever since. Zoo visitors can mingle with a variety of exotic birds, who, free from cages and other typical enclosures, roam about as if they were still in their native South America. 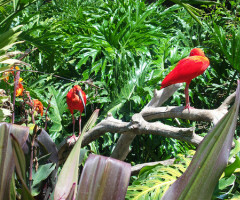 Encompassing an expansive 9,000 square feet, the aviary features such colorful birds as the white-bellied caique, scarlet ibis, emerald toucanet, blue-crowned mot-mot and many more. The theme of the aviary, "How Birds Make a Living," compares a variety of birds' nesting behaviors and feeding and foraging techniques. Visitors will be able to see firsthand how the animal world has its own carpenters, builders, and homemakers. Because not all birds behave in the same way, visitors will be able to explore the various types of activities and behaviors the different birds in the aviary exhibit. 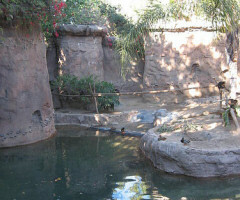 Amazon's Edge is the premier exhibit at the Santa Ana Zoo, featuring a waterfall, lake, and lush island setting. 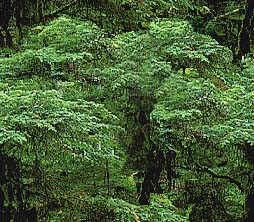 A wooden deck provides for perfect viewing of this slice of Amazonia. Amazon's Edge opened to guests on September 1, 1993 and is home to howler monkeys, mallards, black-necked swans and crested screamers. Visitors on the deck of Amazon's Edge can feel like they have been transported directly into the jungles of Brazil as the comforting sounds of the waterfall drown out all of the nearby freeway and city noises and the tall bamboo surrounds all passages in and out. The wonderful animals complete the setting. It's truly an escape into the "urban oasis." Trivia Note: Amazon's Edge was used as a setting in the Disney movie "Old Dogs," starring John Travolta and Robin Williams. 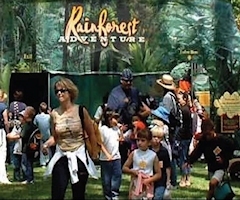 On February 9, 2013, the "Rainforest Adventure" maze opened its twisting passages and dead ends to adventurous explorers of all ages. This educational experience leads you through the layers of the rainforest with four interactive learning stations inside and rainforest-themed questions where right answers lead you deeper into the maze and incorrect ones lead you to full color panels of cliffs and dangerous animals situated at dead ends. Through a generous grant from The McBeth Foundation, the Rainforest Maze puts you on an exciting journey descending from the Emergent Layer and exiting on the Forest Floor! Along the way you'll find games and activities that will challenge you in fun and exciting ways that will leave you wanting to put on your adventuring hat for a return visit. The Rainforest Maze interactive experience is open for adventurers to discover in small groups on a limited basis. Please treat the Maze with respect on your journey. The Bauer Jaguar Exploration Outpost, which opened in August of 2006, is an intricately detailed room full of hands-on experiments and learning, modeled after a real exploration outpost in the Amazon Basin. Learn research techniques about the Amazon Basin animals, weather patterns, and conservation efforts. Also come visit our insect displays and our famous bird-eating tarantula! Since 2004, the Conservation Education theater has been "dedicated to teaching the importance of preserving our natural world." 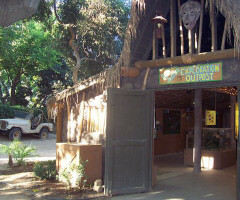 The ideal setting for learning about conservation, the outdoor Theater is shaded by mature trees adjacent to the Tropical Rainforest exhibit. The stage itself is a conservation marvel constructed from approximately 7800 recycled milk jugs! 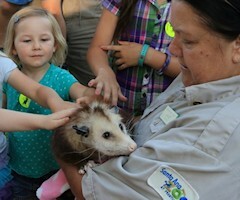 Guests get up close and personal with the zoo's resident master recyclers during animal presentations every weekend, and special programs during holiday events. Learn more about our On Grounds Education Programs here. 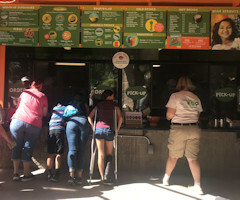 Bean Sprouts is a hip & healthy cafe that offers a variety of choices for the entire family including those who have picky eaters, allergies and other dietary challenges. Bean Sprouts' award-winning Imaginibbles children's menu empowers kids to make their own healthy choices. Grown-ups are delighted with equally tempting adult choices and a coffee bar! Bean Sprouts adheres to clean ingredient guidelines and features organic and sustainable foods, compostable packaging and eco-friendly design. Treetop Toys Gift Shop gives you a chance to purchase that unique souvenir to remind you of your fantastic day at the Zoo. With a variety of plush animals, books about your favorite animals, and Zoo-related toys, Treetop Toys is a perfect place to shop for that animal lover on your gift list. 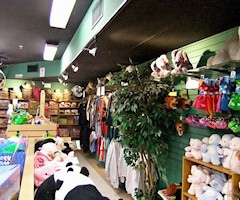 Treetop Toys is conveniently located next to Knowlwood near the Zoo entrance. Be sure to stop in for a warm greeting from our friendly staff! Treetop Toys Online Gift Shop is available here.